RAWIllumination.net: Cosmic Trigger Reading Group, Week One! Greetings and welcome to the RAWIllumination Cosmic Trigger Reading Group. 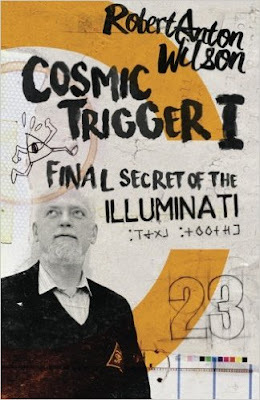 This week we are going to crack the cover and dive into the new edition of Cosmic Trigger, published by Hilaritas Press, the new imprint organized by Bob’s daughter Christina and his friend Rasa of the RAW Trust. Right off the bat I want to offer big thanks Tom Jackson of RAWIllumination for hosting this reading and for giving me the opportunity to facilitate it, and to Christina and Rasa of RAW Trust for all of their hard work creating Hilaritas Press and publishing new editions of a large chunk of the works of Robert Anton Wilson. Finally and most recently we see on the title page that there is an Introduction by John Higgs, author of Stranger Than We Can Imagine: Making Sense of the 20th Century, which is apropos, as Mr. Higgs has a high professional interest in Bob and Tim, and his lens of introduction leans heavily on the notion of Time. 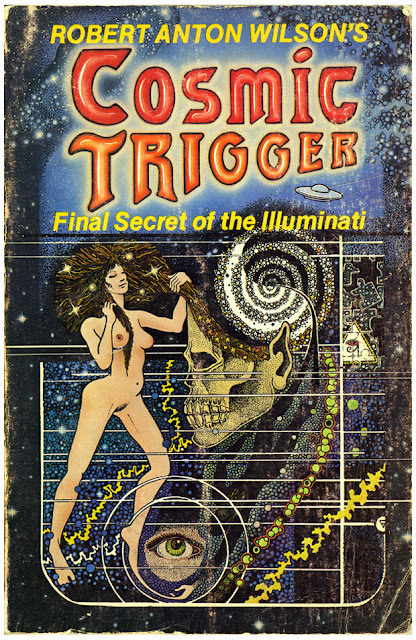 Cover art for the new Hilaritas Press edition of Cosmic Trigger, the official text for this reading group. This week we are going to take a look at that Introduction to see what kind of a framework it can offer us as we prepare to read and discuss a book that is almost 40 years old, and next week we will dig into Bob’s preface and Tim’s Forewords. For those who do not have a copy of the new edition, you can find the Introduction by John Higgs here. Just click on the picture of the cover to Look Inside, and then click on the table of contents in order to access a preview of the Introduction. John Higgs packs a lot into his introduction — Geoffrey Chaucer, Jane Austen, and Charles Dickens; the counterculture’s mid-1970’s Northern California heartland; psychedelic drug culture and cocaine-dominated culture; humanity as an immortal interstellar race; The Beatles, The KLF, and Julian Cope; pookah’s and the Sirius Transmissions; and he wraps it all around a notion that truly great books are both completely Of Their Time as well as Timeless. In the course of illustrating both of these ideas Higgs also opines upon Cosmic Trigger as “the story of one man. . . which connects the personal mythologies of a wide network of people,” ultimately offering up Cosmic Trigger as an all-purpose map for navigating tidal waves of meaning as well as deserts of meaninglessness, an ontological swiss army knife, as it were. Wielded by a guerrilla, no doubt. Last week we asked you to tell us how you found Cosmic Trigger (which you can still do! ), and this week I’m asking you what you did with her once you found her! Please read the intro and then chime in to let us know what strange directions Cosmic Trigger has sent you in. Next week we will cover the 1986 Preface (which can be found here if you have an older edition) as well as the Dr. Timothy Leary’s original Forewords. Happy reading and please comment—the deeper the discussion, the deeper the experience. I read CT recently. I bought it about 20 years ago after becoming interested in magick, Discordianism and being impressed by reading Prometheus Rising. It was always on my 'I'll get round to it one day' pile but I never did. Then recently I worked through Quantum Psychology and did the exercises, which opened my head up in new ways. I then picked up CT again and read it compulsively, cover to cover. Guess I just wasn't ready to take it in the first time. What I really took from it was the working exemplification of the model agnosticism QP explains. It enabled me to re evaluate various experiences from my life and that has proven valuable. I've stopped sweating over whether something is objectively verifiable and found myself more willing to go with the current in order to see where I end up. Uncertainty, subjectivity and probability are welcome guests in my life, rather than obstacles. I like the new intro because it demonstrates how RAW managed to synthesise such diverse elements from literature, science, culture, the occult etc. The ability to synthesise disparate elements is a real high order skill and the mark of something special. RAW has been the person to bring these disparate parts of the picture together for me, from Cthulhu to anarchism to consciousness research. I'd say that was pretty remarkable and I'm glad it is bein recognised. As you start this exploration into Cosmic Trigger, I wanted to send a giant thank you to Adam Clark who has diligently hunted for typos in our new publications. Last week I uploaded corrected versions of Cosmic Trigger and Prometheus Rising. There was not a lot in either book (we already corrected a lot of typos that carried over from older editions), but Adam found a couple of punctuation errors, and an OCR (Optical Character Recognition) error that despite several readings, we had missed. Sadly, we have to recreate all of Bob's books via scanning because the dysfunctional folks over at New Falcon Publications had no interest in making it easier for us to work on Bob's legacy by providing their digital copies (okay, enough complaining). We have the best OCR software available, but it's not human, and with great appreciation from all of us, human Adam found an error that was irksome, but amusing. The OCR software saw the word "modern" in several places, and decided the word must be "modem". I'm guessing the software thought "modem" was more modern than "modern," or at least my whimsy tells me so. If anyone finds any other typos or other errors, please go to www.hilaritaspress.com, and send us a message, and enjoy Cosmic Trigger!! I really like the new cover, don't know who designed it, it reminds me of a Burroughs collage. The large number 23 suggests to me that this book, judging by its cover, embarks upon a voyage through the bardo due to the many associations with death that 23 has here in Cosmic Trigger and in Illuminatus! Wilson has a Horus Eye in the Triangle patch over his heart. The running Eye in the Triangle that he appears to look up to suggests the Nietzschian/Crowley/Burroughs philosophy of "here to go." Also really like the phrase "an ontological swiss army knife" Charles used to describe CT. In a universe next door, Bob wrote a new intro to the 2016 edition with dealt with the Last Decemberist and a certain ostrich. Oz, the fine new cover is from Amoeba Design. He also did the new Prometheus Rising Cover. See also @amoebadesign on Twitter. I found Cosmic Trigger around 2007, in my early 20's. Oddly enough, though I can't recall how, it was on the back of watching The Secret, which I'd caught on TV. I was probably looking up some of the themes online when I happened upon it. Needless to say, CT was far more valuable. At the time, I was in a deep depression and suffering from acute panic attacks. It felt like my life had completely fallen to bits. Nothing seemed to make it any better, and I was absolutely certain that my life was over - I was just existing, waiting for the right sort of despair that would end it for real. Fortunately, I stumbled upon RAW. There are times when I consider this a meaningless coincidence. Most of the time I know better. As I go through this reread, I'll be on the lookout for errors and will send them to Hilaritas. They used to pay me for this. I enjoyed the writers that John Higgs referenced when he wrote that great works are both particularly of their time and also speak to universal experience. I have to admit I haven't read Chaucer since college, but I've read Dickens all my life. I finally read BLEAK HOUSE maybe three years ago, and I thought it was one of the greatest novels ever. And I've loved Jane Austen since discovering her in my thirties. A couple of other comments: John writes, "History has not been kind to many of the speculative scientists Wilson discusses here." The book HOW THE HIPPIES SAVED PHYSICS reaches a somewhat different conclusion. Also Higgs, "Wilson's refusal to insist that his reality tunnel has more validity than that of his readers is, I think, the great gift of this book." Spot on, and I think one of the reasons the book has lasted is that it's such a good exploration of the "reality tunnels" theme. I enjoyed Higg's introduction and his explanation on how different reality tunnels resulted in his experience on Feb. 23. It was not overly scientific or mystical, just a simple description on how they all found different meanings in the event. I recently re-read his insightful biography on Timothy Leary and his entertaining 20th century history book as well. My first read of CT introduced me to so many new ideas and topics, too numerous to list. I'll hit a few high-lights...I completely missed the point and set my new life goal as contact with higher intelligence. I only had Leary's Politics of Ecstacy, so I was introduced to Leary's 70's work which was major for me. I dived headlong into Crowley books, but gravitated to the Golden Dawn's history. I attempted self-initiation into the GD current for a couple of years. There was a lack of acid flow around me at the time so I took RAW's advice in CT and started growing mushrooms. I was introduced to Terrence McKenna, and collect all of his books. As I look back and reflect almost all the books I collected after CT was a direct result of discovering RAW. Rob--I like this thing you wrote: What I really took from it was the working exemplification of the model agnosticism QP explains. It enabled me to re evaluate various experiences from my life and that has proven valuable. How awesome is it that Bob kept offering that thing of great value in so many different ways, knowing that we would need to come across it in great variety for it to finally sink in! Oz--Thanks for "looking into" the new cover. Happy to have you participating in the experiment. Dirtydiscordia--Bob could have had a much more lucrative career if he had gone down the road of The Secret. Tom--I'd love to hear more about How The Hippies Saved Physics. Dustin--I'll be interested to see how this reading of CT affects you.